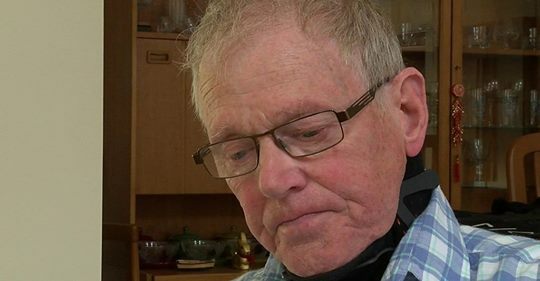 The often-quoted prognosis for MND of “death in 2-5 years” is totally misleading – keeping breathing and maintaining other bodily functions are largely mechanical issues, not medical ones. 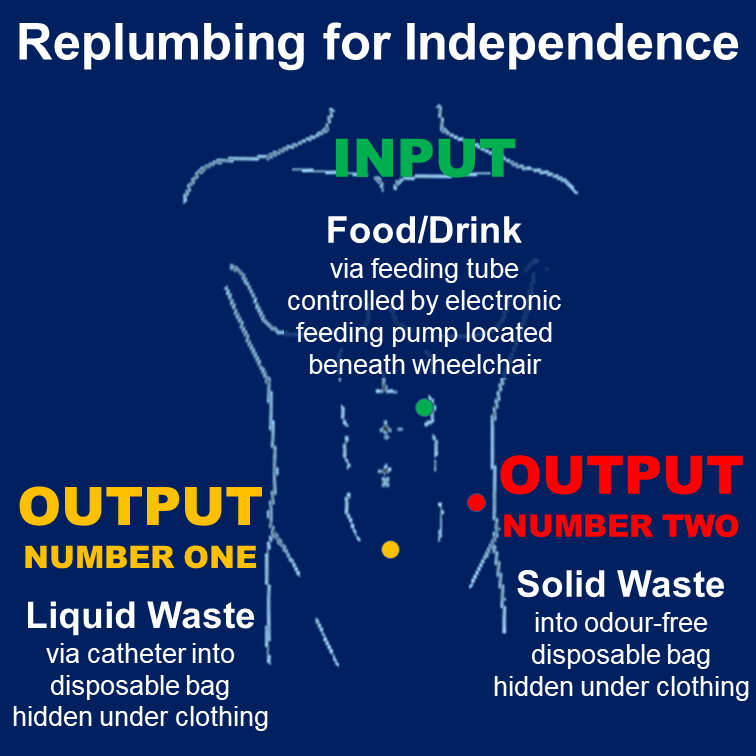 So, because I want to remain largely self-sufficient rather than totally dependent on carers, I’ve arranged to have a gastrostomy, suprapubic catheterisation, and colostomy before my arms stop working and I can no longer feed myself or use the bathroom unaided. I’ll have a tracheostomy well before my lungs can’t cope. That all means that physically I’ll keep going. I want great communication systems. 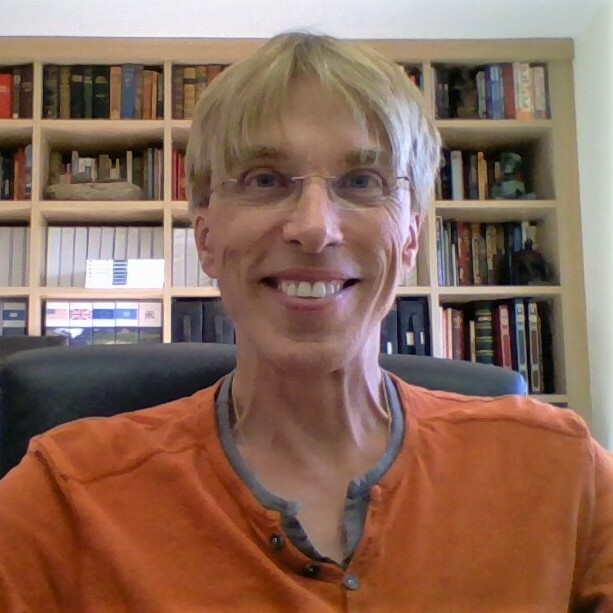 So, while I still have plenty of time, I’m training myself with eye-tracking technology to write up to thirty words a minute as well as control multiple computers. And I’ve trained a voice synthesiser to speak in my own voice. Now I’m researching with the lab that developed it to build in some Expressiveness – so it doesn’t sound like Peter on Tranquilizers. Together, just those two interventions mean I’ll always be able to hold slow real-time conversations even when all I can move is my eyeballs. And interact with anything that uses a remote control. But that’s just the start. I also want new Hi-Tech senses and robotic abilities to replace the ones that get cut off – so my brain is still using much of its innate formidable processing power. 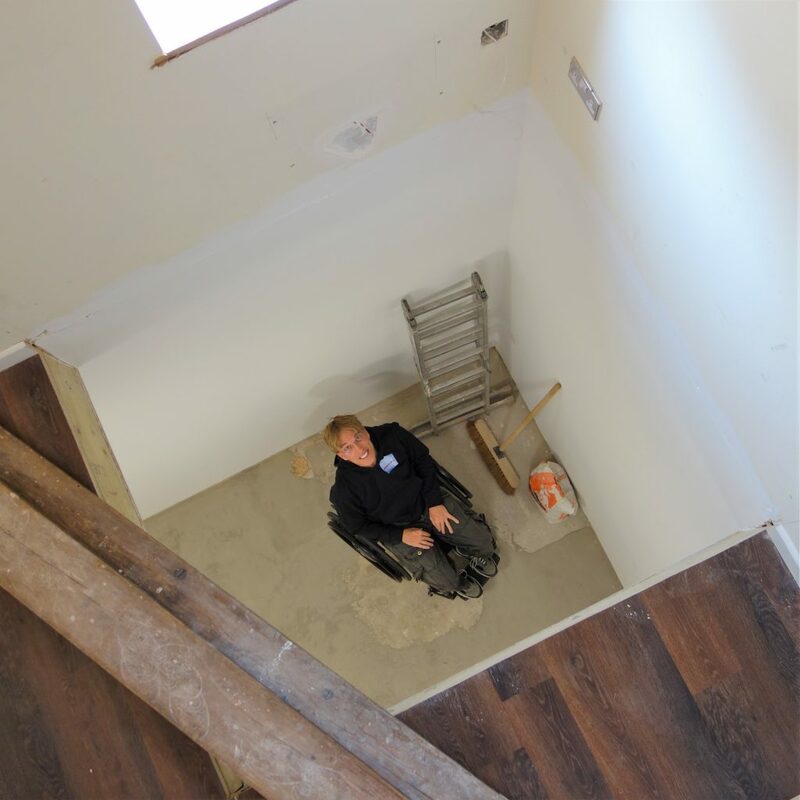 There’s no pain or nausea, and while we can still move we’ve got plenty of time to rearrange our home environment for disabled living. And that just leaves the pesky issue of it being a Terminal Disease. It turns out that the Terminal component of ALS is very largely negotiable. Let me strip away all the sentimental emotion around MND for a moment and look at it coldly from my point of view. It’s actually not ALL bad! And I’d infinitely rather live with MND – than die with MND!! I’m doing everything I can to push back the frontiers of how we can maximise the quality of life for those with MND – and other disabilities. And I’m getting wonderful support from across the board. I’ve been a customer of Lloyds for thirty years. I’ve had Travel Insurance from them for ten years, and never once claimed. I dutifully rang Lloyds Bank Travel Insurance to alert them to my recent diagnosis and ask if I would have to pay any higher premium than usual. [As I’m only in early-stage MND, my medical team confirmed that other than walking I should have no medical problems at all.] I spent a total of about one hour answering questions on the phone. The next day, a computerised letter arrived telling me that, based on the outcome of medical screenings, my Travel Insurance was DECLINED. No explanation other than ‘Motor Neurone Disease’. 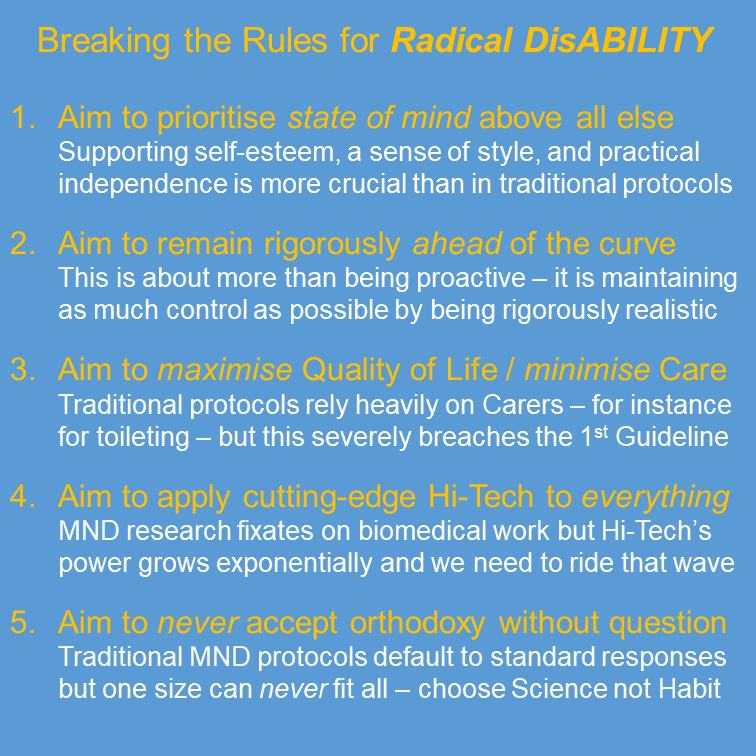 How can we better manage MND? 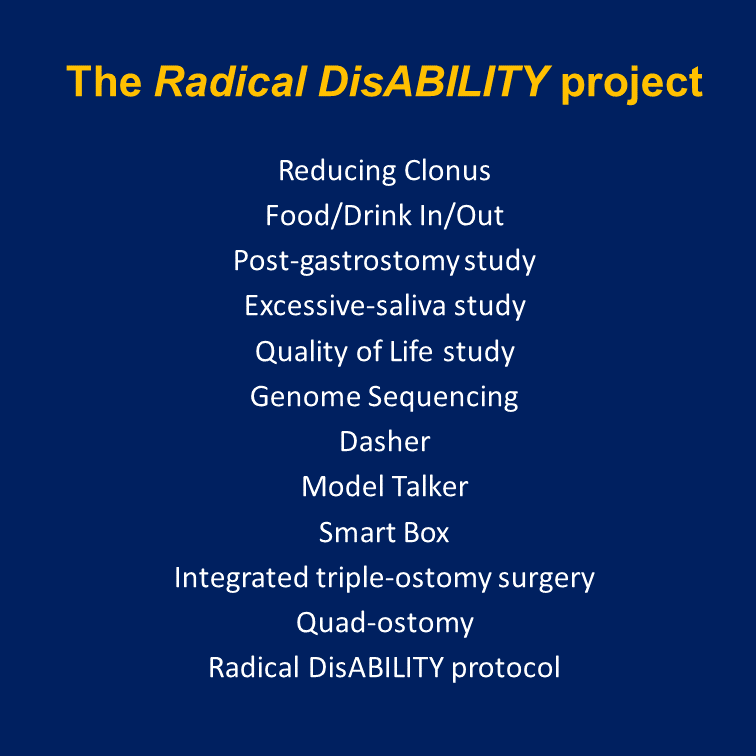 I’m currently acting as a human guinea-pig on numerous clinical-care and technology research projects. These are just the start! Excellent News: I have just got a provisional date of 10 July for my TRIPLE-OSTOMY surgery at Torbay and South Devon NHS Trust. 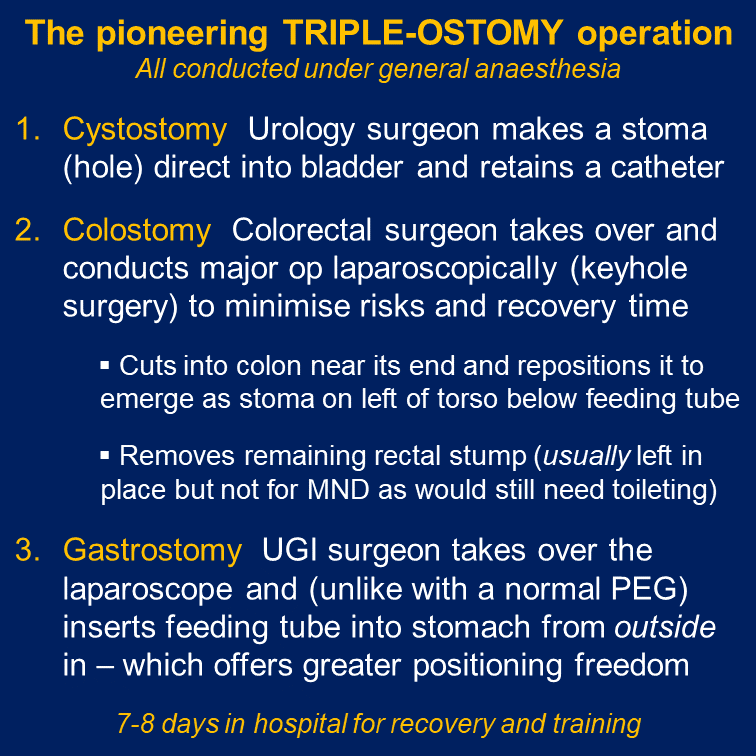 This pioneering operation will involve a team of three surgeons who between them will engineer a cystostomy, a colostomy, and a gastrostomy all in one operation. Looks like this is a FIRST for MND not just in the UK but also the USA. For me it will be LIBERATING! I am very excited. And grateful. I’m really looking forward to the South Regional Conference in Bristol next Sunday of the wonderful (and vital) MND Association. It’s my very first opportunity to meet lots of people passionate about MND and I find the whole opportunity really inspiring. If you find yourself there, please come up to me and say Hello! 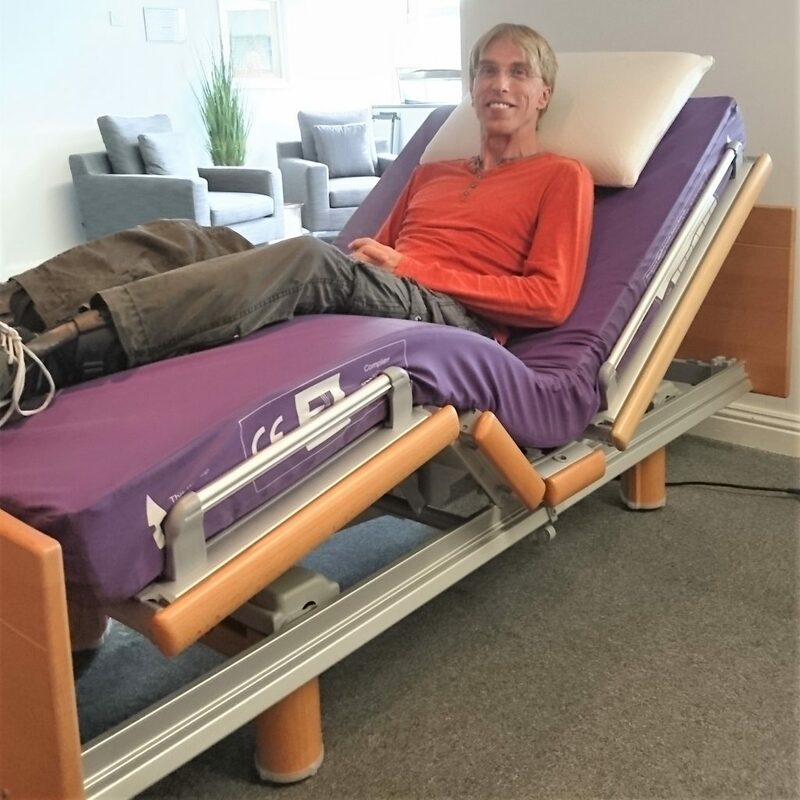 Here are my Lessons Learned: For a wheelchair/carer to fit inside, the lift needs to be HUGE; it takes FOREVER to be made; it costs a FORTUNE; but, unless you can/want to move home, there’s LITTLE ALTERNATIVE! Just finished the truly excellent MND Association South Regional Conference in Bristol – filled with great people and fascinating speeches. 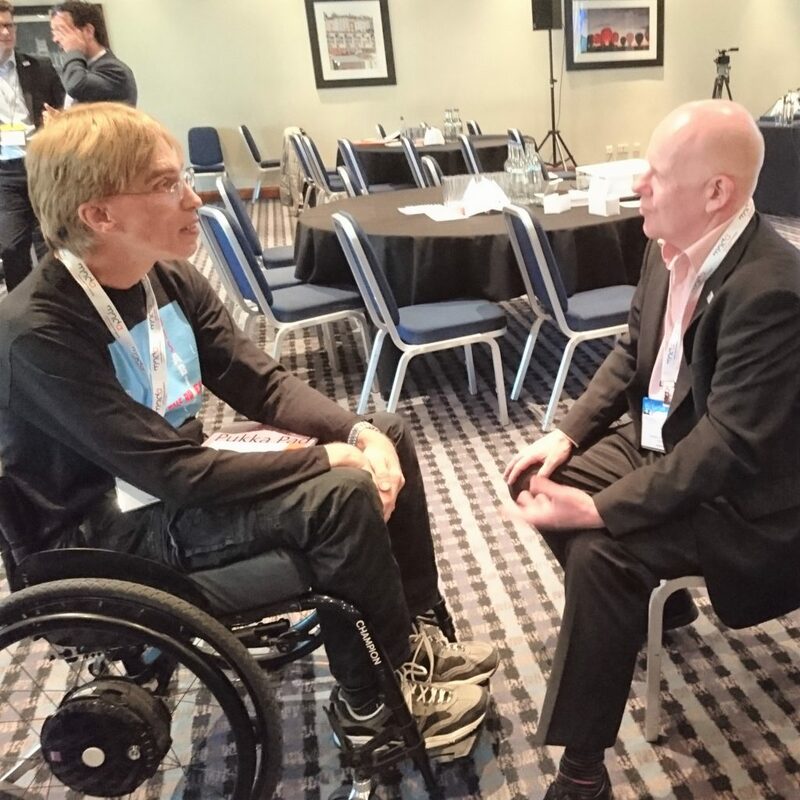 Amongst the many insightful conversations throughout the day I was lucky enough to have a very long chat with Dr Brian Dickie, Director of Research, discussing the major £15.5 million research portfolio that the Association funds. That level of funding has the potential for a MAJOR impact on achieving a world free from #MND. Great stuff! 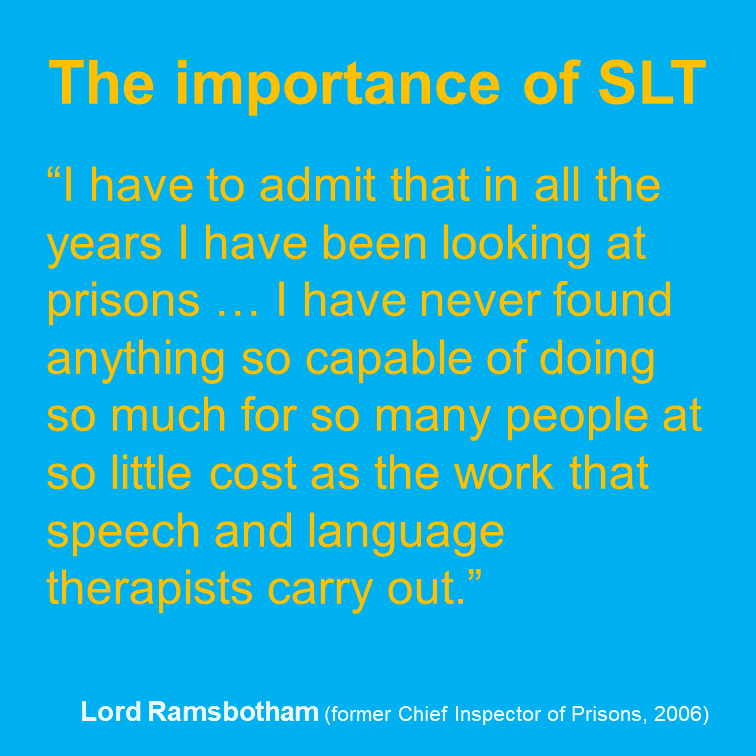 I was reminded by a SLT in Liverpool of this great quote from a Chief Prison Inspector over a decade ago. Not to stretch the metaphor too far, access to PROACTIVE Speech and Language Therapists is CRUCIAL long before you get Locked-In the prison of #MND. Purely as a result of great support from the NHS and the MND Association I unquestioningly voice-banked long before I thought I had to. 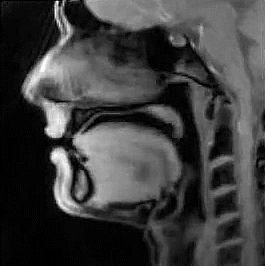 As soon as I’d finished, I got mild dysarthria (problems speaking). PERFECT timing to stay ahead of the curve – but only thanks to pioneering initiatives such as the Voice Banking at Diagnosis Project MND. 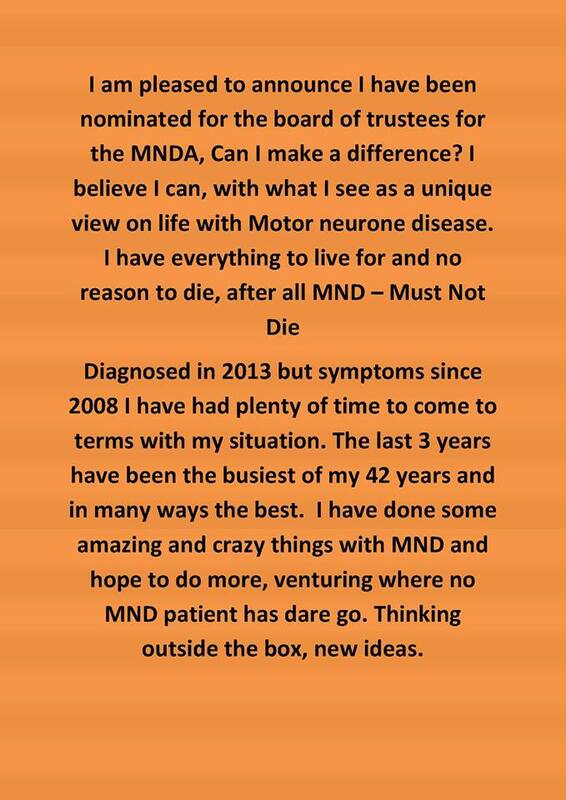 I think it’s absolutely fantastic that Jason Liversidge is standing as a Trustee of @mndassoc! I am too. Wouldn’t it be brilliant if BOTH of us were able to show the world not just how to survive with #MND – but how to THRIVE!! 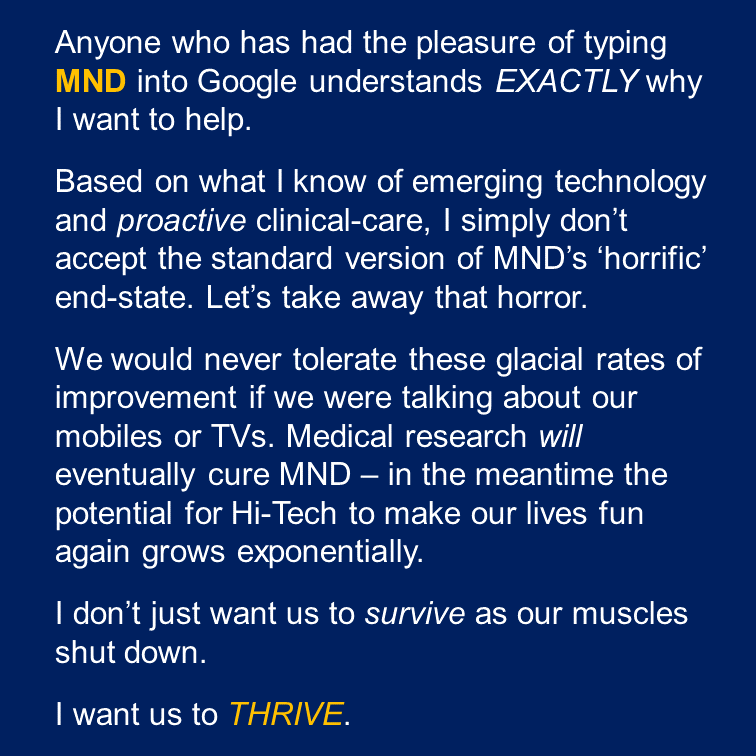 I’m passionate about throwing Hi-Tech at #MND so that those of us who are #plwMND don’t just survive but THRIVE. The Sheffield Collar is a perfect example of how apparently simple innovations can nevertheless be transformative. It uses High-Tech #NASA space-suit material with supports. The alternative is a hot, large foam neck-brace meant for sprains!